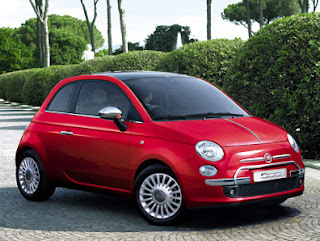 I had the opportunity to try out the Fiat 500 this week. I've seen them on the road, and I've always been tossed between thinking the Fiat was pretty cool, and thinking I wouldn't be caught dead anywhere near one. One thing's for sure, love it or hate it, it's a head turner. Some guy came up to me while I was stopped at a red light and just circled the car and stared at it. I almost wanted to do a hidden camera view as pedestrians walked by my parked Fiat and stopped to check it out. Great: Well, I've written it already, but here it is again. This car is just plain FUN to drive. I get so tired of driving boring cars, and I can't exactly put my finger on what makes a car fun. Why is the Corolla so yawn inducing, and the Cruze interesting? Why is couldn't I wait to give back the Versa, and was sorry to have to return the Mini and the Fiat? Why is Tom Cruise making make Mission Impossible 4? These are difficult questions to answer. Good: I think the European feel of the Fiat adds to it's attractiveness, and may be partially the answer to most of my questions above. It's aggressive, bold, perhaps a little spunky for a little car. It's like it didn't get the memo - it doesn't know it's just a little guy. Maybe it knows and doesn't care. Room to Grow: I'd like the "sport" mode button moved to the gearshift lever where it makes sense. You have to take your eyes off the road to find it at the very time you should be paying attention. Love the fog lamps, wish there were heated seats. Cool mute button on the steering wheel so you can turn off the radio if you get a call (on your hands-free phone) but I wish the radio control buttons were on the steering wheel as well. Would I buy one? In a flash, but only after I test drive it a snowstorm. I'm betting it's a tank (and that's a good thing).